so I have my gold pan, everything is still stock, but I want to play with it longer than 4 minutes. So Looking at a NiMH that will fit inside, the width is 5.25inches, but I can't find a NiMH that fits. Still using the mechanical resistor, wiper speed controller, hopefully it won't burn out with a longer playtime. Grab a shorty pack LiPo and use foam spacers to take up the slack. Or grab a "stick" pack sized LiPo battery that fits. Also grab a low voltage alarm since you will want to cut it off before the lipo gets discharged too far. I would just get an inexpensive brushless set up with a 21.5 or 17.5 motor. The original resistor will go bad and there’s no replacement for them. I raced with the resistor for quite a while when I started out when that car was new and I burned quite a few up. Finally I got a Novak ESC and won the first race I had it. Give them a ring or drop them a email to ask. 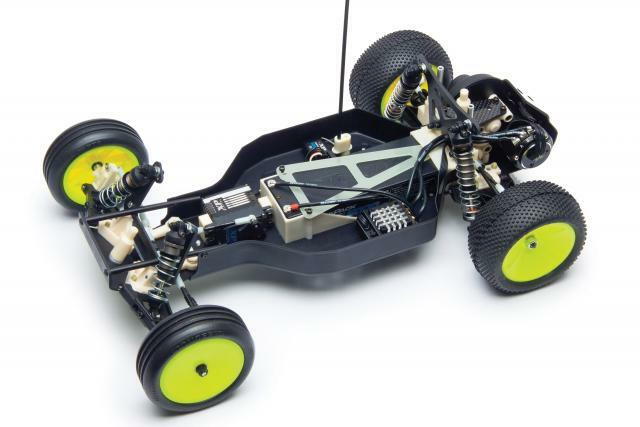 The RC10 World's Car buggy is the pinnacle of vintage RC10 buggy performance. The replica features modern-era upgrades while retaining the spirit of the original RC10 World's car that crowned Brian Kinwald as 2WD I.F.M.A.R. World Champion in 1993. The new World's Car is equipped with updated V2 hard-anodized threaded shock bodies and aluminum adjustment collars to provide improved performance and adjustability. *The drivetrain now features the famous Stealth 3-gear transmission with a ball differential, CVA axles and V2 slipper to harness the power of modern brushless motors. A new durable plastic gear cover was added to protect the V2 slipper and gears. * The included 2.2" wheels fit current 2WD buggy tires so racers can select the right tire for their track. The RC10 World's Car kit updates make the buggy easier to build and service without altering the authentic look of the original car. The black hard-anodized machined chassis, trimmed front kick-up plate, black motor mount, and nose brace tubes look like the original parts. Some plastic parts have been updated to improve durability, accept modern batteries and components, or increase performance. Color matched with the original World's car kits, these parts are backwards compatible with original cars. Take a journey through time and drive a Team Associated RC10 World's Car -- it's worlds better now than it was back then! Last edited by SocalSnakeEyes; 03-11-2018 at 04:04 PM. Reedy will fit the old bulkhead. Those old MSCs didn’t last too long with anything stronger than a 27t stock motor. The original transmission can easily handle a 17.5 as long as it has bearings and the gears are checked for burrs. We used to run 14-15 turn motors with 7cell NiCad batteries back then which is probably a tad stronger than a current 17.5 with a 2s LiPo. Plus with a modern ESC you can easily dial back the power.